The inductive charger casing facilitates convenient charging via wireless charging according to Qi-standard. The charger casing is suitable for the iPhone 5, iPhone 5s or iPhone SE. 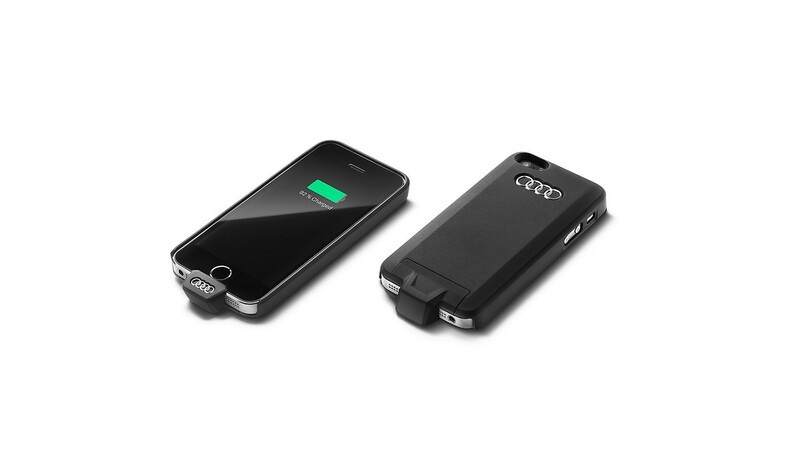 The convenient and simple charging process can be undertaken while driving with the Audi phone box with wireless charging or with the inductive charger station. Thereby, the smartphone is always at hand. Easily removed charging clip for alternative charging and synchronisation via a Lightning cable. Loudspeaker, sensors, button, headphone socket and camera are accessible. The charger casing protects against scratches, small knocks and soiling and has been certified by Apple (MFI) according to iPhone guidelines. We recommend when using the inductive charger casing that you also use the service part Audi phone box spacer from the mobile phone installation kit. We also recommend using the Audi phone box or the inductive charger when using the inductive charger case with an iPhone 5, 5s or SE. The Audi phone box is available for the following models: A3 (from 2017), A3 Cabriolet (from 2017), A3 Saloon (from 2017), A3 Sportback (from 2017), A3 Sportback e-tron (from 2017), A3 Sportback g-tron (from 2017), A4 Avant (from 2016), A4 Avant g-tron (from 2017), A4 Saloon (from 2016), A4 Saloon, long (from 2017), A4 allroad quattro (from 2017), A5 Cabriolet (from 2017), A5 Coupé (from 2017), A5 Sportback (from 2017), A5 Sportback g-tron (from 2017), A6 Avant (from 2015), A6 Saloon (from 2015), A6 Saloon, long (from 2016), A6 allroad quattro (from 2015), A7 Sportback (from 2015), A8 (from 2018), A8 L (from 2018), Q2 (from 2017), Q5 (from 2017), Q7 (from 2016), Q7 e-tron (from 2016), RS 3 Saloon (from 2017), RS 3 Sportback (from 2017), RS 5 Coupé (from 2018), RS 6 Avant (from 2015), RS 7 Sportback (from 2015), S3 (from 2017), S3 Cabriolet (from 2017), S3 Saloon (from 2017), S3 Sportback (from 2017), S4 Avant (from 2017), S4 Saloon (from 2017), S5 Cabriolet (from 2017), S5 Coupé (from 2017), S5 Sportback (from 2017), S6 Avant (from 2015), S6 Saloon (from 2015), S7 Sportback (from 2015), SQ5 (from 2017), SQ7 (from 2017), TT Coupé (from 2015), TT RS Coupé (from 2017), TT RS Roadster (from 2017), TT Roadster (from 2015), TTS Coupé (from 2015), TTS Roadster (from 2015). Not usable with the wireless charging adapter as the iPhones 5, 5s and SE are too big for the holder. Clever. Loudspeaker, sensors, buttons, headphone socket and camera are freely accessible (patent AUDI AG). Secure. Charging current minimised when temperature reaches 45°C.